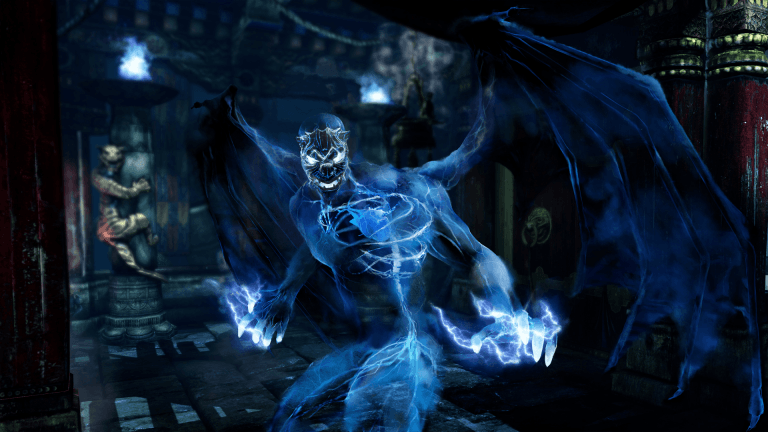 Omen is a blue-hued demon—an Astral being created by the Shadow Lord known as Gargos. Proclaiming proudly to all that he is the “Herald of Gargos,” he serves his master obsequiously. Omen was formed from the very thoughts of his maker, for in the Astral Plane certain powerful creatures like Gargos—a member of a race of demigods called Ichoriens—can force reality to bend to their imaginings; and through sheer force of will create “living” beings. Dog-like, servile, and unquestioning, Omen gladly slays anyone who stands in the way of his master. He has no compassion for humans whom he sees as lesser beings. Omen was promised his own kingdom here on Earth once Gargos rules the planet. And Omen’s first slaves will be the Killer Instinct heroes, and anyone else who has the audacity to stand up to Gargos. Omen will torture them and inhabit their bodies…steal their thoughts and crush their souls. When Omen was tasked with inhabiting the body of Jago (after Gargos had tricked the monk into opening his soul to him in the guise of the Tiger Spirit) he possessed the noble warrior and controlled him like a puppet. Omen forced the monk to traverse the globe, carrying out brutal attacks on anyone that Gargos believed would stand in his way; and with every victory he channeled vast amounts of shadow energy back to the Astral Plane for Gargos to wax in power. For the first time in his existence, Omen was free of the Shadow Lord’s leash, and like a wild dog set loose in a rabbit hutch, Omen relished his opportunity to spread chaos in the name of his master. But then Jago started fighting back against Omen, usurping control of the shadow energies the demon had been channeling through his body, pushing himself back to the forefront and ejecting Omen from control. Stranger still, the shadow energies that Jago unleashed to dispel the parasitic being did not destroy Omen outright or even force him back to the Astral Plane. Instead these shadow energies congealed as a corporeal form, trapped on the Mundane Plane. At first terrified, both of the event and of what Gargos would do to him, Omen quickly became aware that being independent was more enjoyable than possession ever was. But the Herald of Gargos was dumbfounded when the shadow form of that warrior-monk (the thing known as Shadow Jago) emerged in the aftermath of his possession of Jago. That wasn’t supposed to happen. Omen’s brief taste of living inside a corporeal form was intoxicating, and he longs to inhabit human form again, as this construct he inhabits now lacks the ability to enjoy human sensations. For many of Jago’s thoughts, desires and memories were imprinted on Omen’s Astral brain. Love, hate, despair and joy…none of these strange feelings Omen had known before taking over Jago’s flesh. And he craves them like a drug. Perhaps, Omen muses, he will be rewarded with Jago when his master rules the Earth. And then Omen will rip Jago’s soul from his body and send it screaming into the Abyss. He will cast aside his own ugly winged form and enter the body of Jago again, morphing into an Astral/Human hybrid that is capable of tasting the pleasures of both dimensions. But he is torn between loyalty to its master—the great Shadow Lord—and the idea that he might be capable of something more than servitude. Omen is beginning to see the light streaming through the shadows. That’ll do it for this week, but we’ll be back next week with a look at Aganos. Let us know what you think of this story, as well as any other story in our forums.